Solution: Each set is ordered(n,l,ml,ms). 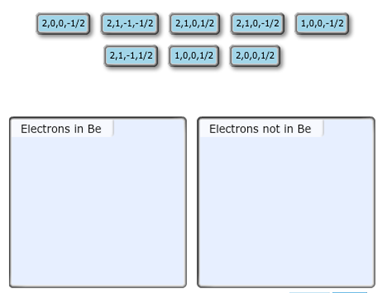 Identify the sets of quantum numbers that describe all the electrons in the ground state of a neutral beryllium atom, Be. Each set is ordered(n,l,ml,ms). Choose the appropriate items to their respective bins. Each set is ordered(n,l,ml,ms). Identify the sets of quantum numbers that describe all the electrons in the ground state of a neutral beryllium atom, Be. Each set is ordered(n,l,ml,ms). Choose the appropriate items to their respective bins.